You are currently browsing the archives for the Tim Pawlenty category. Tim Pawlenty’s flier is causing quite a stir. It’s definitely gotten under the skin of Minneapolis Mayor Jacob Frey. The flier “features several uniformed Minneapolis officers standing next to the candidate for governor in front of two squad cars.” Frey “said the mailer may have violated two city policies, calling it an unauthorized use of the Minneapolis police trademark and citing a prohibition on officers other than the union president or a designee appearing in a political advertisement.” That isn’t what’s bothering Frey the most, though. Mayor Frey apparently is under the impression that sanctuary city laws are constitutional. If he wants to pick that fight, I’m betting that a Pawlenty administration would be more than happy to have that fight. The government can’t tell anyone that they can’t express their political opinions. There’s a strong case that can be made that this ordinance violates these officers’ First Amendment rights. Again, I’m betting that a Pawlenty administration would be happy to help with that fight. This Duluth News Tribune editorial endorses Tim Pawlenty as the Republicans’ best shot at retaking the governorship. Normally, endorsements don’t mean that much but I think this one matters. It isn’t because I think the endorsement itself is that impactful. I think it’s impactful because Tim Pawlenty was given the time and space to explain why he’s running. In my estimation, he made the most of that opportunity. The difference between Gov. Pawlenty then and the conditions he’d walk into now are dramatic. When he first won the office, he inherited a $4.2 billion projected deficit from Jesse Ventura and a terrible economy. This time around, he’ll walk in at a time when the US economy is hitting on all cylinders. Thanks to that robust economy, Gov. Pawlenty will have the chance to reform the tax system that Gov. Dayton created. What does Pawlenty want to do if elected again? He wants to slow down health insurance premium increases and maybe even reduce them. He wants to provide tax relief to middle- and modest-income Minnesotans, including by getting rid of Minnesota’s rare tax on Social Security benefits. And he wants to modernize and improve Minnesota schools and the state’s educational system to finally close the achievement gap and to help meet growing workforce needs. 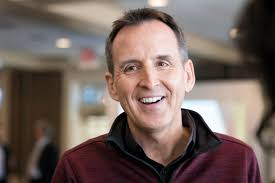 Tim Pawlenty is the best choice to lead the Republican Party of Minnesota. He’s got universal name recognition. He’s got the funding network that’ll be needed to fight off the DFL candidate. Most importantly, he’s got a reform-minded substantive agenda that conservatives can rally around. Jeff Johnson is touting the issues he wants to run on. That’s admirable. He’d be a fine governor if he got elected. The thing is, though, that he’d have a difficult time getting elected. You can’t govern if you don’t get elected. Republicans have a fantastic opportunity to reform Minnesota’s economy. To do that, though, we need unified Republican control of St. Paul. We can’t get there with Jeff Johnson. He’s already lost 2 statewide races. I’m not willing to bet that the third time is the charm. There’s too much at stake to entrust to a 2-time loser. Tim Pawlenty has started running an ad that takes a shot at Gov. Dayton’s incompetence in administering government assistance programs. Before we watch the ad, though, it’s important to note that Pawlenty has listed this issue as a high priority on his campaign’s issues page. I consider this ad to be effective. First, Pawlenty ‘narrates’ the ad, in essence telling people what he thinks is important while highlighting what’s wrong with government. Next, he closes by saying that he’d use those savings to lower health care costs for Minnesotans who work hard and obey the law. In both cases, the ads were short, concise and about things that Minnesotans care about. Johnson’s ad definitely goes after Tim Pawlenty, which is what I’d expect since Johnson first has to win the primary. I thought it was gratuitous for Johnson to say that Gov. Pawlenty “gave us higher spending.” When Gov. Pawlenty started in office, Jim Knoblach chaired the House Ways and Means Committee. It’s foolish to think that there was a massive spending increase at that time because Gov. Pawlenty inherited a $4.2 billion projected deficit from Jesse Ventura. 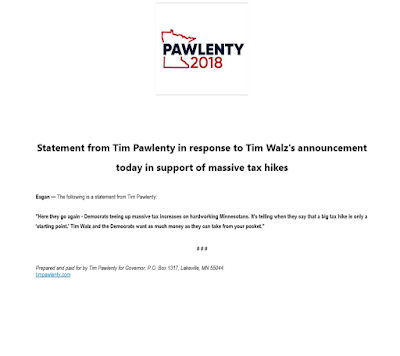 Pawlenty and Knoblach eliminated that deficit without raising taxes. It’s fair, however, to mention the fee increases. The ad is a bit misleading in that Pawlenty had to battle DFL supermajorities in the 2007 and 2009 budget sessions. That’s when Republicans relied on Gov. Pawlenty to be our goalie. Overall, the ad is somewhat effective because it’s somewhat misleading. Here they go again – Democrats teeing up massive tax increases on hardworking Minnesotans. It’s telling when they say that a big tax hike is only a ‘starting point.’ Tim Walz and the Democrats want as much money as they can take from your pocket. With the DFL, Minnesotans get Bernie Sanders’ failed economics, Ilhan Omar’s anti-Semitism and Mark Dayton’s incompetence. Trust me when I say that isn’t the trifecta you’d be proud of hitting. There’s a word for that type of trifecta. That word is failure. Deep inside this article are 2 paragraphs that makes me wonder about Commissioner Jeff Johnson. 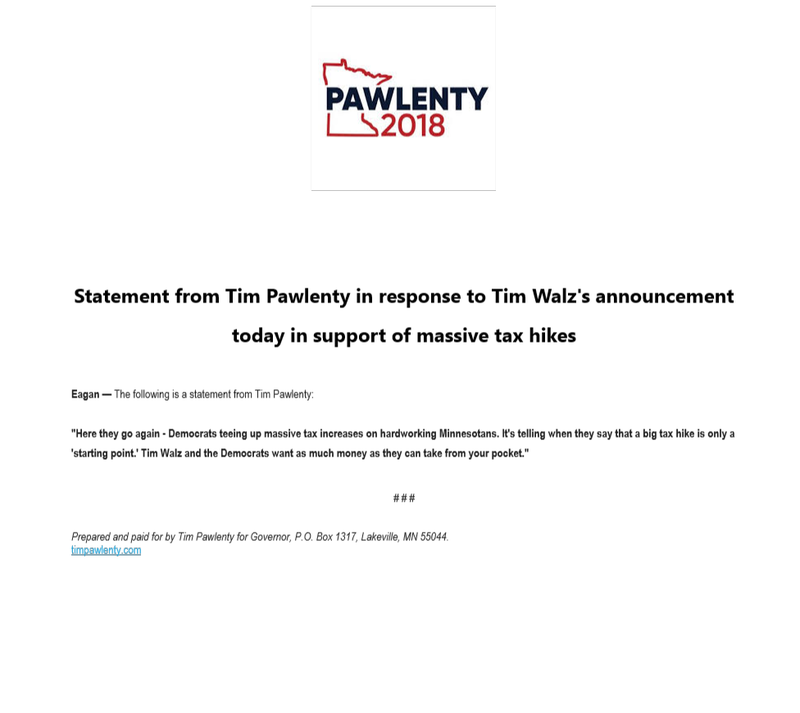 One of the first official communications, if not the first, from the Pawlenty campaign was a criticism of Tim Walz, who wants to turn Minnesota into a sanctuary state. This statement was published on May 2. It’s difficult to think that Gov. Pawlenty is simply pandering to primary voters. I don’t make much of Commissioner Johnson finally addressing the issue until 2 months later. I don’t think Johnson is weak on immigration. What I think is that Johnson is employing a double standard. Apparently, when Jeff Johnson talks about refugee resettlement or immigration, it’s done for the purest of reasons. Apparently, he thinks that when Tim Pawlenty talks about immigration, it’s because it’s polling well, nothing more. I don’t recall immigration being a top priority while Pawlenty was governor but that doesn’t mean it wasn’t a priority for him. Whatever the case, it’s clearly a problem this time. One thing that’s always been true of Gov. Pawlenty is that he’s a pragmatic, problem-solving politician. At the end of the day, Jeff Johnson’s complaining comes across as whining. It diminishes him. That’s a shame because he’s actually a pretty good guy. The Republican nomination race for Minnesota governor took a contentious turn Thursday with a hard-hitting TV ad from former Gov. Tim Pawlenty. After months of Pawlenty ignoring his primary rival, he unloaded on Hennepin County Commissioner Jeff Johnson as part of a six-figure ad campaign, the first commercials he has run during the race. Johnson responded with his own swipes but probably won’t be able to match Pawlenty’s reach, given the relative cash positions of their campaigns. Johnson took the sudden attention as a sign “that the race is close. It was a good day in the campaign. I said the day that he attacks is a day he knows he might lose. Obviously, we got there earlier than I thought we would,” he said. This race isn’t close. The Outstate.US poll shows Pawlenty leading by 34 points. Even if the margin of error was high, Johnson would still be miles behind. Pawlenty’s campaign said Johnson threw the first punches months ago and they’re ready to respond in kind. “The Pawlenty campaign is not going to take anything for granted, and we want to ensure that Republican primary voters know exactly where Jeff Johnson has been on these important issues,” said Pawlenty adviser Brian McClung. It isn’t that Johnson is being competitive. It’s more likely that Pawlenty has decided it’s time to all-but-officially end the primary. The difference between Tina Smith and Karin Housley is that Tina Smith serves the special interests. Karin Housley serves people. Sen. Housley proved that by vigorously attempting to fix the elder abuse scandal in Minnesota. Rather than just hold a press conference, Sen. Housley put together legislation that would’ve fixed many of the problems. Unfortunately, Gov. Dayton, who Tina Smith served with for 3+ years, vetoed the bill. Yes, Miss Hinderaker has a famous dad who happens to be a pretty good blogger. But I digress. This isn’t that tight of a race. Further, I’ve gotten word that Johnson isn’t connecting with voters in the Seventh and Eighth districts because he isn’t working with the grass roots up there. If the Johnson campaign isn’t reaching out to the grass roots activists, then he deserves to lose. After reading this article, I’m certain that the DFL doesn’t have any visionaries running for governor. In fact, I’ll say one more thing. It’s clear to me that the DFL candidates aren’t top tier candidates. Walz too talked about changing political culture. And just as Murphy often references her nursing profession, Walz often cites his time as a social studies teacher. “We believe in education and we do it in that classroom because it doesn’t have to be a pejorative to talk about government,” said the six-term member of Congress from Mankato. “It’s us. It’s the people who make decisions in communities. But we have to make sure those most impacted by decisions are at the table. “The behind-closed-doors thing is undermining our basic faith…we’re a very polarized nation and that is holding us back,” he said. Perhaps Walz is complaining about what happens behind closed doors because he’s never been invited to closed-door negotiations. That’s because he’s never been a committee chairman. That’s because, for 12 years, he’s been a nobody in Congress. Quick rule of thumb: Nobodies in Congress aren’t visionaries. Johnson complained of “arrogance” in state agencies and said he seeks to change “the very culture in St. Paul. I got into this race almost 14 months ago and I got in for a very simple reason: to give people more control over their own money and over their own businesses and over their own kids’ education and over their own health care and, frankly, over their own lives,” Johnson said. With Johnson, at least you know there’s something substantive that he wants to accomplish. There’s no question that he has a number of goals in mind. It’s worth watching even though they don’t poll the match-up between Erin Murphy and Tim Pawlenty, which is the likely match-up this November. Murphy is the DFL favorite because, in my opinion, she’ll dominate the Twin Cities vote while Lori Swanson and Tim Walz split the rural vote. The poll shows that Tim Pawlenty leading Jeff Johnson 54%-20%. That isn’t a position Johnson is likely to rebound from. With all due respect, President Trump didn’t just mention Fischbach as the sitting lt. gov. of Minnesota. President Trump also mentioned that she’s “got a big race” and that “she’s gonna do great” in that upcoming race. The bigger point is that Jeff Johnson travelled to Duluth in the hopes of getting Trump’s endorsement and came away without getting mentioned. That’s noteworthy considering the fact that he’s the Republicans’ endorsed candidate for governor. I don’t dislike Jeff Johnson. I think he’s a good man who’s solid on policy. It’s that I like Tim Pawlenty more. Pawlenty has clearly had a better run of things in terms of fundraising than Johnson. President Trump’s mention of Lt. Gov. Fischbach won’t help Johnson’s fundraising. On the DFL side, Erin-Squared will likely win the DFL Primary because Lori Swanson and Tim Walz will likely split the rural vote while E-Squared will feast on urban votes thanks to the DFL primary in the Fifth District. That primary will be way in the rear-view mirror by the time November rolls around.